Just 1 dollar per application. 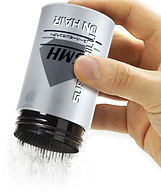 Super Million Hair fibers are 0.3 to 0.5mm in size. That’s 30 times bigger than the smallest size that can be blocked by nasal mucosa and nasal hair.